3G/HD/SD profanity delay system, available in four versions. It's one of the few products available that's designed for protecting video as well as audio. This flexible and affordable profanity delay system can give you the amount of protection you need - whether you just want to mute the offensive audio or whether you want to switch cleanly to another video source. Preventing the broadcast of any unwanted audio or video material - including expletives, obscene gestures, wardrobe malfunctions, bloopers, competitor mentions, coughing fits or technical problems. Try out the Cleanit 1 VisionWeb demo and the Cleanit 3 VisionWeb demo (open in new window) – you'll see how easy it is to operate Cleanit from your web browser. These are example GUIs as you get to choose which controls to show when you order Cleanit. Cleanit allows a video and audio content stream to be delayed to prevent the broadcast of unwanted or offensive material, with both audio and video covers available. The programme signal can be delayed by up to ten seconds in 3Gb/s, 20 seconds in HD or 110 seconds in SD. This delay gives the operator – who is monitoring the live feed – time to react and remove the unwanted content. Cleanit is an easy-to-use fully integrated solution which is based on the Crystal Vision Indigo range of modular products and frames. Different packages are available – allowing you to purchase as much or as little protection as needed for your application. 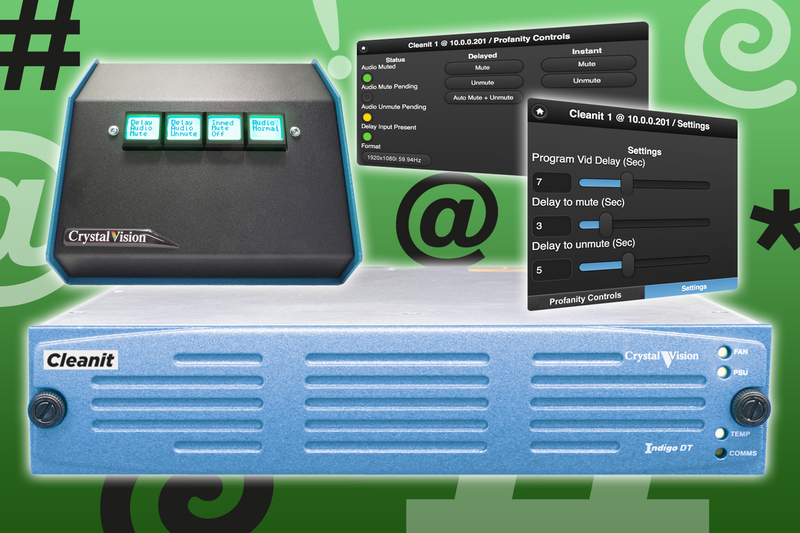 The three standard versions of Cleanit take care of the most common applications, muting or shuffling either embedded or discrete AES or analogue audio, along with video freeze or black. Choose Cleanit Custom and we'll design a custom solution for you, understanding your application and adding whatever extra functions you need to the mix. Once you've selected the most suitable version of Cleanit for you, you need to select a frame to house it in. 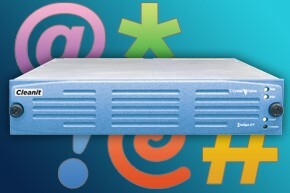 One standard Cleanit will fit in a desk top box (pictured here), ideal for those wanting a portable system. 1U ears can be fitted to the desk top box to facilitate mounting in a control desk, while the IDT-RK rack mounting kit allows it to be fitted in a 19" rack if required. For multi-channel applications (or for those wanting power supply redundancy), up to three channels of Cleanit can fit in a 1U frame or six in a 2U frame – making the most of your rack space. The two control options for Cleanit make configuration and operation easy and ensure that you always know the status of your audio and video. VisionWeb Control is a free-of-charge way of operating Cleanit from a web browser running on any device connected to the same network. The simplified VisionWeb GUI makes it easy to set the delay timings and activate the video and audio covers, as well as providing feedback status of when the system has been initiated and when it returns to normal operation. The SBB-4 smart button box is perfect for live operation. With big buttons to press, it features clear text (using LCD graphics) and colour indications of function and status – such as the button flashing orange while counting down. There are three active buttons available for programming and one status button. The SBB-4 works in conjunction with VisionWeb, with – for example – VisionWeb providing the delay time variables and status information. 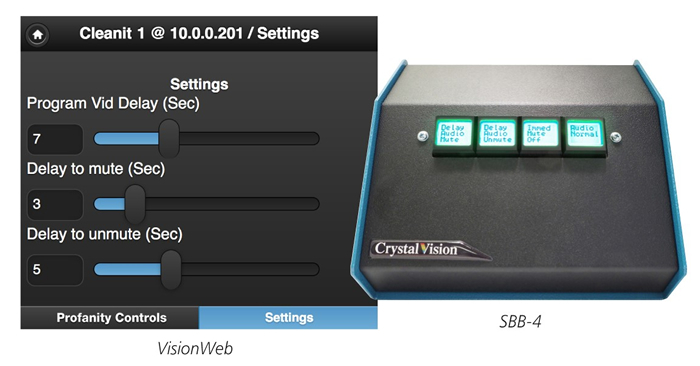 The SBB-4 connects to the Crystal Vision frame via Ethernet. It uses PoE (Power over Ethernet) for convenience and therefore needs to be connected to a PoE enabled switch. All versions of Cleanit include flexible customisation of the control GUIs and button box to satisfy your individual requirements. You will be asked which of the controls should be visible on the VisionWeb GUI and what functionality to assign to the push buttons on the SBB-4. Both audio and video covers are available – either independently or simultaneously. To mask the unwanted audio, the operator can mute the audio, shuffle to another embedded source or (with Cleanit Custom) to an external discrete source. To mask the unwanted video, the operator can freeze or black the video or (with Cleanit Custom) insert a graphic or switch to another live or recorded source. The cover/uncover functions can be activated either manually or automatically and be either delayed or immediate. Using manual delayed cover/uncover is ideal when you don't want to lose more of your programme than is necessary and you have an operator able to concentrate on this task, as it involves them both starting and stopping the mute or freeze. Delay timings can be set for the delayed mute or freeze and the delayed unmute or unfreeze. Here's an example timeline for a system using manual delayed cover/uncover for a three second obscenity. Here we've set the programme video delay to ten seconds, the mute delay to eight seconds and the unmute delay to ten seconds. We assume that the operator has one second of reaction time before muting and unmuting. Using automatic delayed cover/uncover is ideal when your operator is multi-tasking and only wants one button to press to clean the air. With this option you will need to choose suitable delay settings in advance, with the delay timer counting down to audio mute (or video freeze) then continuing to count to unmute (or unfreeze). With this option, you have fixed the expected length of the obscenity. If the obscenity is longer than expected, you have other measures in place to get rid of it – for example, moving the microphone or having the profanity delay system set to automatically drop the offensive caller. Here's an example timeline for a system using automatic delayed cover/uncover. We don't know how long the obscenity is going to last so we have guessed appropriate settings. Here we've set the programme video delay to ten seconds, the mute delay to eight seconds and the unmute delay to 13 seconds. We assume that the operator has one second of reaction time before muting. This is ideal for emergency situations where you have missed the profanity. You can immediately mute the output using Instant mute or Instant mute and freeze. When using the SBB-4 smart button box, you can hold down the button for the required duration of the cover. The Instant unmute can be used for testing or if a mute request needs to be cancelled. Signal to noise - 99dB (+18dBu) rms., 22Hz to 22kHz typ. Total harmonic distortion: 0.004% THD+N rms., 22Hz to 22kHz typ. Interchannel crosstalk: -110dB at 1kHz, -90dB at 20kHz, rms., typ. Signal to noise: 99dB (+18dBu) rms., 22Hz to 22kHz typ. Total harmonic distortion: 0.002% THD+N rms., 22Hz to 22kHz typ. Custom solutions are available to meet specific customer requirements. The specification will change depending on the options chosen.